Oho has been making great music since the early 70s, seemingly swerving and dodging any typical styles and genres as they avoided the classification game, instead going for whatever direction their muse took them at any point in time. The three founding members O’Connor, Heck, and O’Sullivan (Hence their name OHO) have long left the band (although Mark O’Connor is a guest on one track here), multi-instrumentalist and singer Jay Graboski who had joined by the time of the band’s first album Okinawa in 1974 is still among the members, all through the years guiding the band through their continuous evolution. 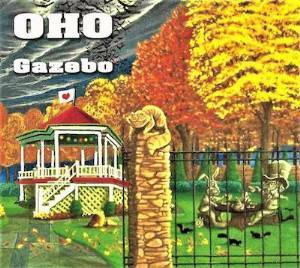 And still, on their latest album Gazebo, the band still eschews any kind of classification, other than in a very general sense. In addition to Graboski, the current members include Ray Jozwiak (vocals, keyboards, and accordion) and David Reeve (drums, vocals, keyboards and more), the latter having been with the band since 1976. In addition, no less than twenty guests have contributed to this track or that adding everything from trombone, French horn, saxes, bass, 12 string, pedal steel, percussion, additional vocals and more. The eighteen cuts herein are all listed as group compositions (with the exception of a couple interpretations) but one can sense that the diversity of what’s on offer here shows that ideas are hatched and developed by individual band members and from that point developed as a group, having a lot of fun along the way. Thus, the tunes represent more of what the members’ interests are instead of trying to shoehorn their sound into any genre. One can find a little bit of everything herein, though everything on offer is played and sung impeccably by a group of experienced musicians who probably don’t care if you like it or not, it’s what they do, and being independent of any record labels, it’s all at their prerogative and pleasure. “How Is Where We Go” is a great tune, and a catchy one as well, and pretty much exemplifies OHO’s creation process: write and arrange a great tune with thoughtful lyrics, bring it to life with whatever is needed to perfect it (some pedal steel went a long way in this case, plus additional lead guitar, percussion and vocals), and you end up with a tune that meets a number of criteria of excellence and doesn’t really sound like anything you’ve heard before. The opener “Ring in the Rightness” is a tune that is just as vital, a funky and powerful rocker with a horn section featured. The band does a tasteful cover of Randy Newman’s “Baltimore,” perhaps with a bit more of a rock punch than the original, with some great sax soloing from guest Gene Meros, following that up with “Blood Brother,” a good-timey piano tune that sounds like something from another era, with a horn section featureds. “Denial” is another great tune with powerful arrangements and great lyrics and harmonies, built on an acoustic guitar roadbed with accordion and other arrangements supporting judiciously. With a good 65-plus minutes of great new material, the band added a couple excellent tunes “Slough of Despond” and “Limousine” that were on their two previous albums Where Words Do Not Reach and Bricolage respectively, and “Unique” which was an instrumental tune on the former, now is re-featured with lyrics. “Ocean City Ditty” which was originally an overtly commercial sounding single released a few years back by the band, is now remixed with additional female vocals and a horn section, with an overdubbed DJ intro and outro. “Out of Thin Air” is an old OHO tune from the early 90s, but a classic that got a complete re-recording here, much improved from the original that opened the OHO album in 1990. “Bleeding the Fifth” is a downright heavy tune with guest lead vocals/guitars from Barry Lee Reichart , a thunderous bass line and overdubbed layers of screaming guitars throughout. The album’s pièce de résistance comes near the end, and who would have thought that anyone could combine The Yardbirds' “Over Under Sideways Down” with the famous Disney tune “It’s a Small World” and make it work, but OHO did it, and although this doesn’t sound much like either of the originals (though it tracks the Yardbirds a bit more closely), it’s a great interpretation of both tunes more or less superimposed on one another. Nothing short of brilliant. All taken, Gazebo is another great step forward from a band who’s name is synonymous with adventure and unpredictability.